Giving someone a handmade gift shows that you put in more thought and effort than a purchased gift. 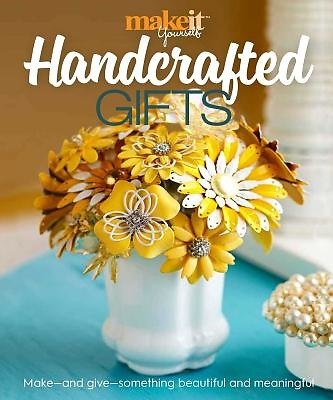 Whether you want to make a wall hanging or a tiny terrarium, Handcrafted Gifts has more than 200 ideas and inspirations for everyone. Make It Yourself magazine serves the new generation of crafters captivated by Etsy and Pinterest, inspiring them to dabble in a variety of techniques. No matter how eagerly they may embrace technology, they proudly wear the badge of -maker---someone who loves creating things by hand. Each of the projects in Handmade Gifts is presented with a finished image; step-by-step instructions, illustrations, and photos; and corresponding patterns where necessary. The look and feel of the book puts a fresh spin on traditional crafting with youthful, on-trend DIY fashion, accessories, and decor. With Handcrafted Gifts, you now have a simple, easy-to-follow guide to creating both simple and intricate mementoes for those you care about.